Hello all and welcome to Day 3 of Hero Arts 2016 Summer Catalog (to be released on April 18th) Preview. 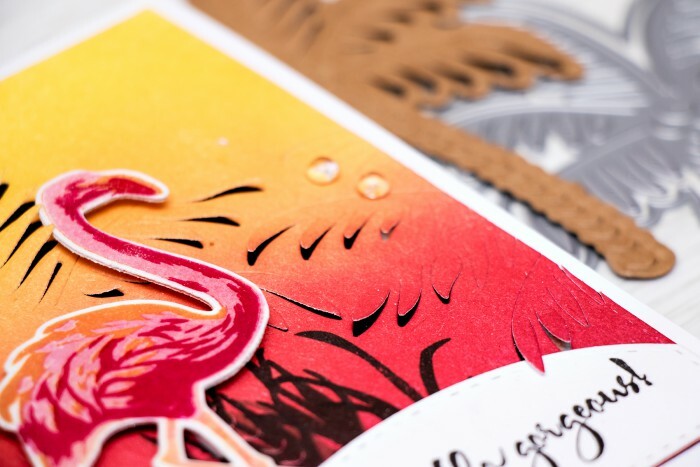 We are sharing a peek at the new Paper Layering dies and I can tell you right away – they are to DIE for! Especially the palm tree. Seriously, even if you haven’t got any palm trees where you live (there are none here in Ukraine), you can still use them for a card and dream about a tropical getaway while making it. At least that is what I was doing – I was remembering our Sri Lanka vacation and dreaming about the next time we will get to go to the tropics. 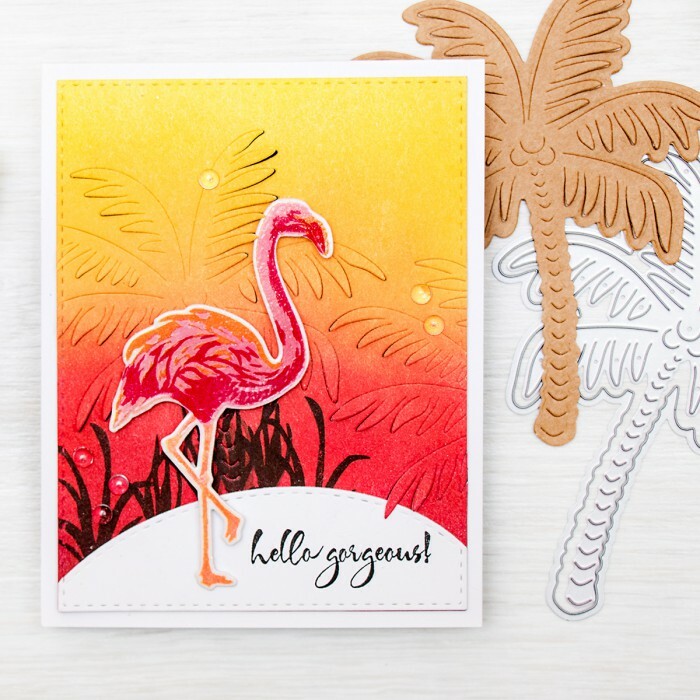 I’m also using one of the new Color Layering stamp sets – Flamingo (I have another card in the catalog using this set, I’ll share it later); every time I look at this set all I can picture is a sunset in gorgeous warm red and yellow colors and flamingos standing against it. 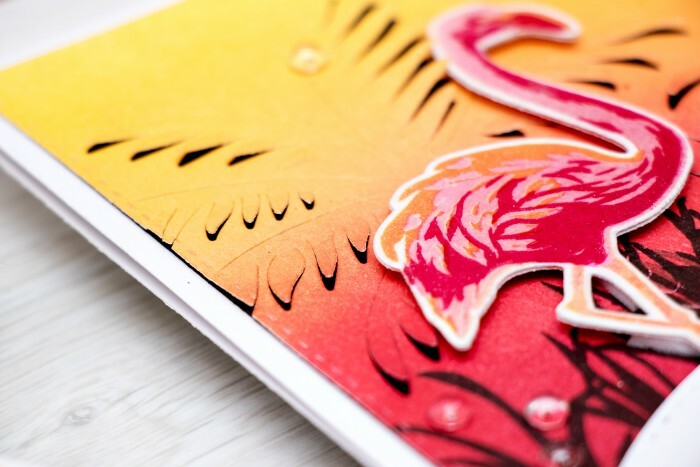 My flamingo was stamped using several colors of ink and heat embossed in Clear Embossing Powder to make the colors pop. This is very similar to a technique I shared in my “Sparkling Gold Fish” card post. The Palm Tree Paper Layering die has two parts to it – the paper layering part and the outline (and you can see how those two look together on the top photo), I only used the paper layering part for my card today and die cut subtle palm trees in the background. First I did lots of ink blending to create this sunset-type background. I used quite a few colors of ink from Hero Arts and I have them all listed at the end of the post in the supply section. I layered the die cut background onto a black panel to create deep shadows under the die cut leaves and lifted the leaves up a bit with my fingers to create physical dimension. I also added quite a few clear drops from Pretty Pink Posh to embellish the background on this project. Do you have any favorites from the catalog already? I wonder what products you are most excited about. Feel free to share below! 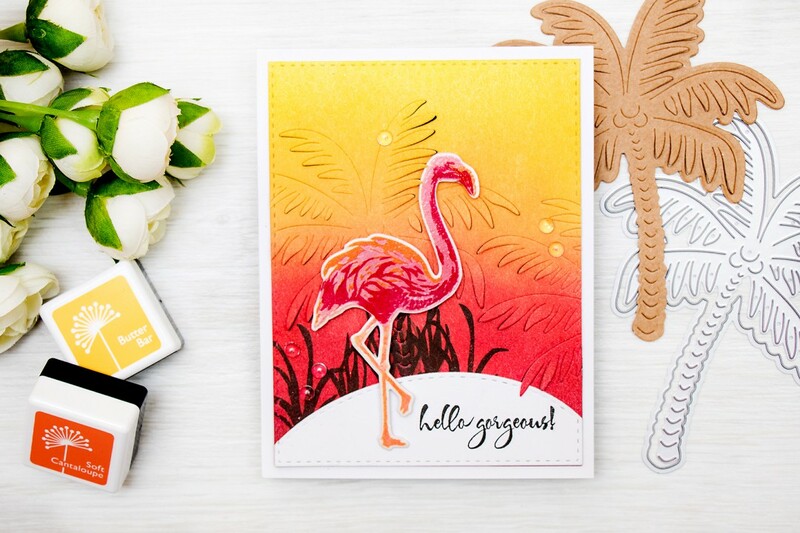 Gorgeous tropical scene love this new Palm die. I love the layering stamps, specifically the Goldfish layering and butterfly layering! Beautiful card love the background the colors are gorgeous. Oh, WoW! I love these colors and that fabulous palm tree background just barely popping up!!! I love how the tree die just adds a bit of texture… very creative! Oooh I love this vibrant tropical scene! These new products are so cool! I love the effect of the layered die for the background. 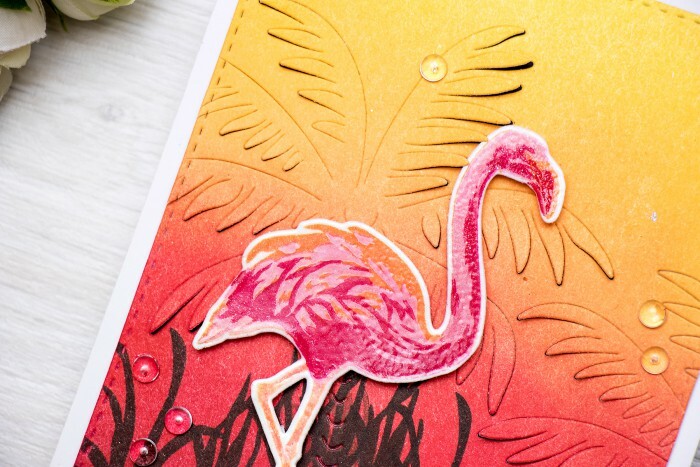 I rally like how you used the palm tree die to add texture to your card background!